My cats love these - keeps them entertained for ages as they can fly and creep. Attaches to the end of the wands imitating a colourful Dragonfly. If your cats like to chase Dragonflys , this is the refill for them! Made of CHENILLE fabric from shorn Sheep wool/Yarn, the chenille yarn is manufactured by placing short lengths of yarn, called the "pile", between two "core yarns" and then twisting the yarn together. Plus feather sadle wings and feather stems for legs. 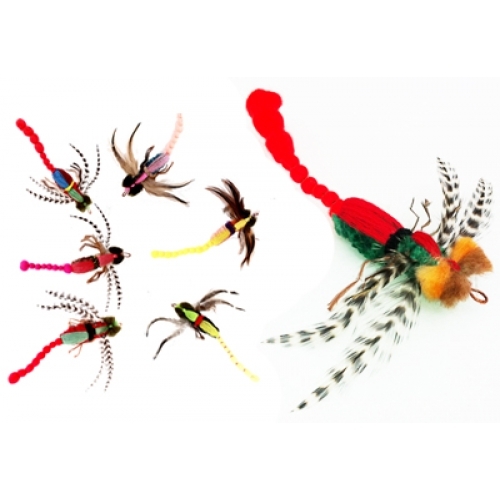 Realistic Adult Dragonfly size approximately 5cm long x 1.5cm in body plus wings span of 10cm wide and long 7cm bright yarn tail. The Dragonfly is made with the yarn fixed to a plastic bar running through the middle (No sharp metal bar!) The connection to the wand toy is via a strong braided cord hook on the front securly fixed. 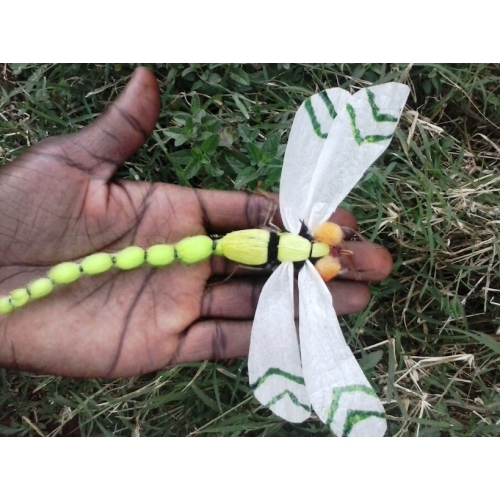 PLEASE NOTE - The Dragonflys legs and wings are made from natural real feathers & steams so are a delicate part of the toy for decoration purpose and can break off. The body is solid and very durable to take a beating!